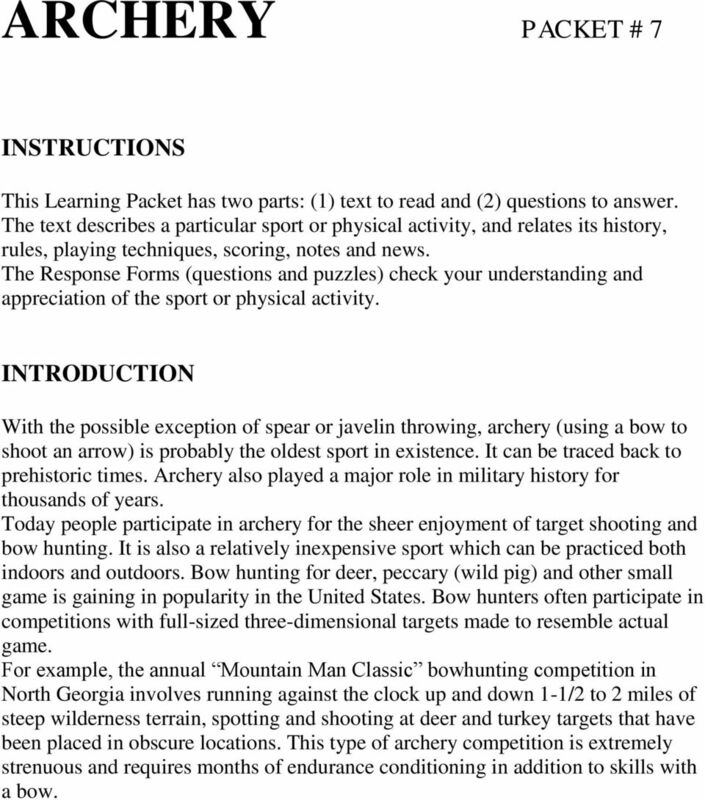 Download "ARCHERY PACKET # 7 INSTRUCTIONS INTRODUCTION"
1 ARCHERY PACKET # 7 INSTRUCTIONS This Learning Packet has two parts: (1) text to read and (2) questions to answer. The text describes a particular sport or physical activity, and relates its history, rules, playing techniques, scoring, notes and news. 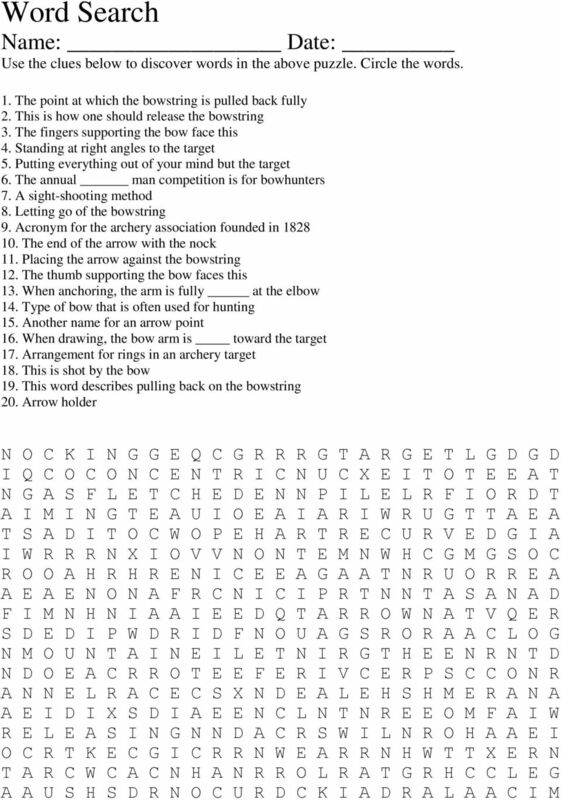 The Response Forms (questions and puzzles) check your understanding and appreciation of the sport or physical activity. INTRODUCTION With the possible exception of spear or javelin throwing, archery (using a bow to shoot an arrow) is probably the oldest sport in existence. It can be traced back to prehistoric times. Archery also played a major role in military history for thousands of years. Today people participate in archery for the sheer enjoyment of target shooting and bow hunting. It is also a relatively inexpensive sport which can be practiced both indoors and outdoors. Bow hunting for deer, peccary (wild pig) and other small game is gaining in popularity in the United States. Bow hunters often participate in competitions with full-sized three-dimensional targets made to resemble actual game. For example, the annual Mountain Man Classic bowhunting competition in North Georgia involves running against the clock up and down 1-1/2 to 2 miles of steep wilderness terrain, spotting and shooting at deer and turkey targets that have been placed in obscure locations. This type of archery competition is extremely strenuous and requires months of endurance conditioning in addition to skills with a bow. 2 HISTORY OF ARCHERY In prehistoric times, people used bows and arrows to hunt for food and for selfdefense. During the Greek and Roman civilizations, armies used the skill of trained bowmen to win many battles. Archery achieved new status as an American sport in 1828 when an association called The United Bowmen of Philadelphia was formed. This group is still in existence today. The National Archery Association (NAA) was founded in It still sponsors annual national archery competitions. 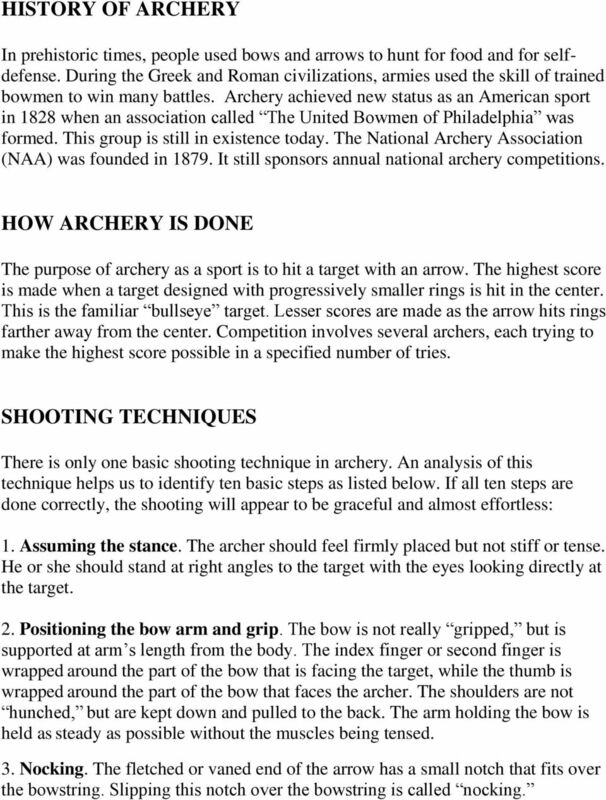 HOW ARCHERY IS DONE The purpose of archery as a sport is to hit a target with an arrow. The highest score is made when a target designed with progressively smaller rings is hit in the center. This is the familiar bullseye target. Lesser scores are made as the arrow hits rings farther away from the center. Competition involves several archers, each trying to make the highest score possible in a specified number of tries. SHOOTING TECHNIQUES There is only one basic shooting technique in archery. An analysis of this technique helps us to identify ten basic steps as listed below. If all ten steps are done correctly, the shooting will appear to be graceful and almost effortless: 1. Assuming the stance. The archer should feel firmly placed but not stiff or tense. He or she should stand at right angles to the target with the eyes looking directly at the target. 2. Positioning the bow arm and grip. The bow is not really gripped, but is supported at arm s length from the body. The index finger or second finger is wrapped around the part of the bow that is facing the target, while the thumb is wrapped around the part of the bow that faces the archer. The shoulders are not hunched, but are kept down and pulled to the back. The arm holding the bow is held as steady as possible without the muscles being tensed. 3. Nocking. The fletched or vaned end of the arrow has a small notch that fits over the bowstring. Slipping this notch over the bowstring is called nocking. 3 4. Drawing. Drawing or pulling back on the bow string utilizes both arms and the upper body muscles. The bow arm is raised toward the target as the string arm pulls backwards. The upper arm, shoulder and upper back muscles should not be too tense, or the draw will be executed improperly. During this step, many archers find that it helps to take a deep breath and hold it. 5. Anchoring. It is critical that the string be pulled back to a proper anchor point. This is the point at which the bowstring arm has reached full flexion or bending at the elbow. The position varies according to the particular individual s skeletal and muscular lever system. As little as 1/8 inch in anchoring can affect shooting accuracy. 6. Relaxing. Archers need to take time to assure that only the muscles involved in supporting the bow and drawing the bowstring are tense. Overall performance improves when archers pay attention to this point. 7. Aiming. The sight-shooting method is a popular way of shooting at targets. A mechanical device is attached to the bow and can be both horizontally and vertically adjusted. The sight is fastened to the back of the bow slightly above the arrow rest. The archer should close the left eye or right eye (depending on whether the archer is right- or left-handed) and look at the sight pin. Then he/she should align it with the center (gold circle) of the target, also allowing for distance and wind (if any). 8. Concentrating. As with all sports, the ability to concentrate in archery often makes the difference between excellence and average performance. The archer should put everything else out of his/her mind and concentrate on the target. 9. Releasing. Smoothly release the string, holding the string fingers steady and relaxed without any snap or jerk to the hand. The arrow is now sent on its way. 10. Follow-through. Hold your stance for a few seconds after release. EQUIPMENT AND CLOTHING A first and major step in learning archery is identifying and understanding the equipment. A potential bowman will choose either a straight bow or a recurved bow (a bow in which the tips curve back to form an arc). The length of the bow depends on the individual needs of the purchaser, including his/her age, weight and height. Some hunting bows have complex compound curves, with equally complex systems of pulleys and bowstrings. Bows range in length from 48 to 70 inches. 4 Longer bows are used for target shooting and shorter bows for hunting. Most hunting bows weigh more than target bows, which usually range in weight from 10 to 50 pounds. It is always best to buy a bow that is light enough to be handled comfortably. The weight of the bow does not refer to how much it would weigh if put on a set of scales. Instead, weight in archery refers to the amount of weight in pounds you would have to attach to the bowstring to bend a stationary bow a specific amount. This is often called the draw weight. Thus a 70-pound bow does not weigh 70 pounds. Instead, it requires 70 pounds of pulling force to bend the bow a certain amount. Bowstrings are made of synthetic materials such as Nylon or Dacron. Archers often wax their bowstrings as protection against the elements. Arrows are carried in an arrow holder called a quiver, or, in the case of hunting bows, are often attached to a rack on the bow itself. The arrow is composed as follows: A point or pile, which varies from a simple sharp point to broadhead, quintuple-sectioned steeple-shaped heads. A shaft and a shaftment, or rear of the arrow. A nock or notch at the end of the arrow that fits over the bowstring. Feathers, vanes or fletches at the nock end of the arrow, which help the arrow to fly in a straight line toward a target. Some archers use a leather arm guard worn on the inside forearm of the hand that supports the bow. A leather tab or a shooting glove is often worn to protect the fingers that draw back the bowstring. Archers should always wear comfortable, uncluttered, form-fitting clothes. Jewelry, large buttons, scarves and big pockets will only get in the way of the bow and arrow. 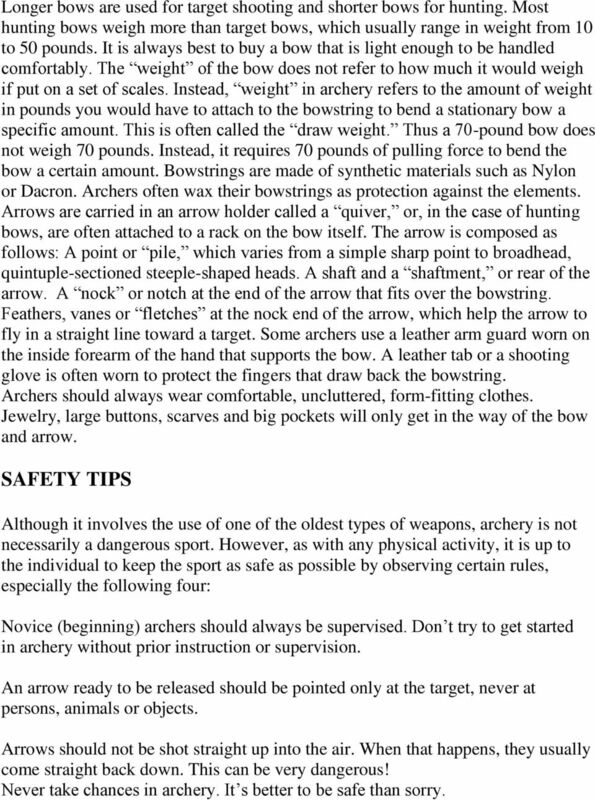 SAFETY TIPS Although it involves the use of one of the oldest types of weapons, archery is not necessarily a dangerous sport. However, as with any physical activity, it is up to the individual to keep the sport as safe as possible by observing certain rules, especially the following four: Novice (beginning) archers should always be supervised. Don t try to get started in archery without prior instruction or supervision. An arrow ready to be released should be pointed only at the target, never at persons, animals or objects. Arrows should not be shot straight up into the air. When that happens, they usually come straight back down. This can be very dangerous! Never take chances in archery. It s better to be safe than sorry. 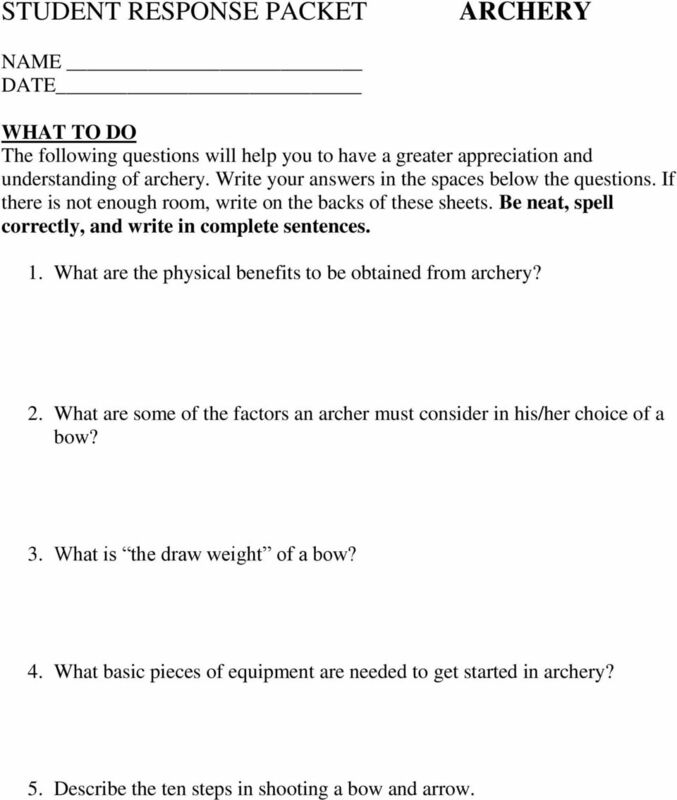 5 STUDENT RESPONSE PACKET ARCHERY NAME DATE WHAT TO DO The following questions will help you to have a greater appreciation and understanding of archery. Write your answers in the spaces below the questions. If there is not enough room, write on the backs of these sheets. Be neat, spell correctly, and write in complete sentences. 1. What are the physical benefits to be obtained from archery? 2. 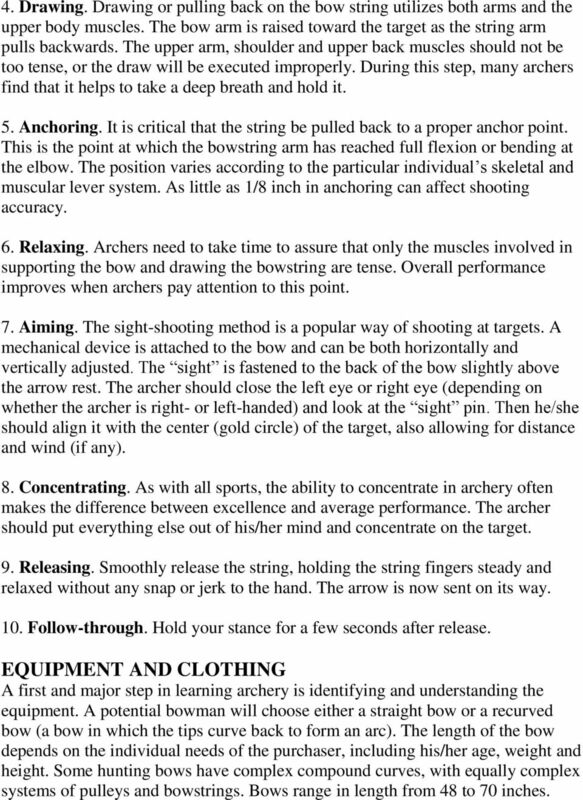 What are some of the factors an archer must consider in his/her choice of a bow? 3. What is the draw weight of a bow? 4. What basic pieces of equipment are needed to get started in archery? 5. 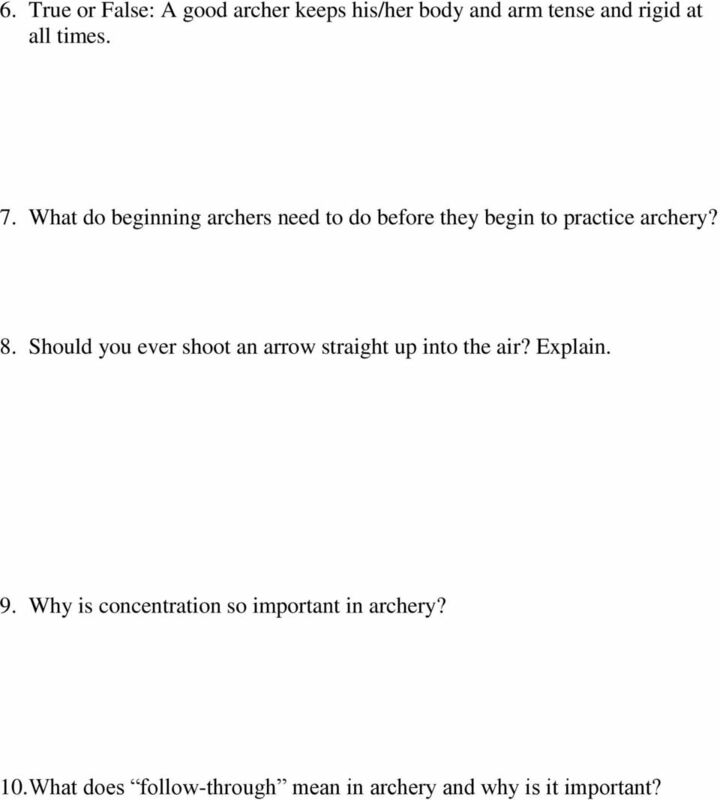 Describe the ten steps in shooting a bow and arrow. 6 6. True or False: A good archer keeps his/her body and arm tense and rigid at all times. 7. What do beginning archers need to do before they begin to practice archery? 8. Should you ever shoot an arrow straight up into the air? Explain. 9. Why is concentration so important in archery? 10. What does follow-through mean in archery and why is it important? INTRODUCTION TO ARCHERY During the course the Instructor will review, archery safety, shooting form, and types of equipment. SOCCER PACKET # 9 INSTRUCTIONS INTRODUCTION HISTORY OF SOCCER. This Learning Packet has two parts: (1) text to read and (2) questions to answer. 4) Read and study the steps and illustrations first to get an overall picture of the project. Then come back and commence practice. Saskatchewan 4-H 3830 Thatcher Ave. Saskatoon SK S7K 2H6 Ph: (306) 933-7727 Fax: (306) 933-7730. Archery. Member s Manual. www.4-h.sk.